This is where debates and opinions can vary greatly. At the very least, the lighting that you will need for your pico reef will depend on the types of corals and other life you wish to keep. DISCLAIMER: You must use a lamp designed for housing a PAR38 Bulb to ensure it functions correctly and doesn't cause a fire. I will not be responsible if your house burns down due to your improper usage of the bulb. What you see on our site is NOT the correct housing for A PAR38 Bulb. Since I have a habit of changing my mind at the drop of a hat, I wanted a lighting option to allow me to keep everything but more specifically SPS corals like birdsnest and montipora and LPS like acans, candy canes, and frog spawn. What will you keep and what are their light requirements? Will the bulb(s) produce heat? How will you mount the light? You should have already made a list of things you want to keep in your pico reef, if not you need to do that now. If you aren’t quite sure, the best bet is to go big so that you have options down the road. As mentioned before, I planned on keeping SPS corals so I will need the best light possible. The following reviews are from my personal experience. I'd be happy to hear your experience and opinions, so please let me know in the comments below. 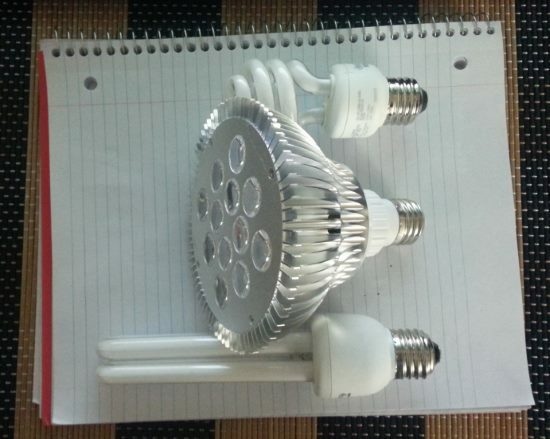 Regular CFL bulb vs 8" Coralife vs LED bulb. Originally I bought this bulb to light my tank before I realized what I wanted to keep. I quickly realized that the bulb was generating a lot of heat which was being transferred to the jar. I saw a 2f change over an hour when the light was on. This was unacceptable. Since this is a long blub (8”) a typical goose neck wouldn’t be the best choice to power it because the bulb is designed to shine down horizontally rather than vertically. A small custom hood would need to be constructed since I couldn't find the small Coralife hood. This would be potentially dangerous for an inexperienced electrical worker like me. ​Later I was thinking more about this bulb and I also wasn’t sure if the intensity of the light would be strong enough for SPS corals. Instead of taking a gamble with the life in my jar, I decided to move on. I spent $24.99 on this light but it won’t go to waste. 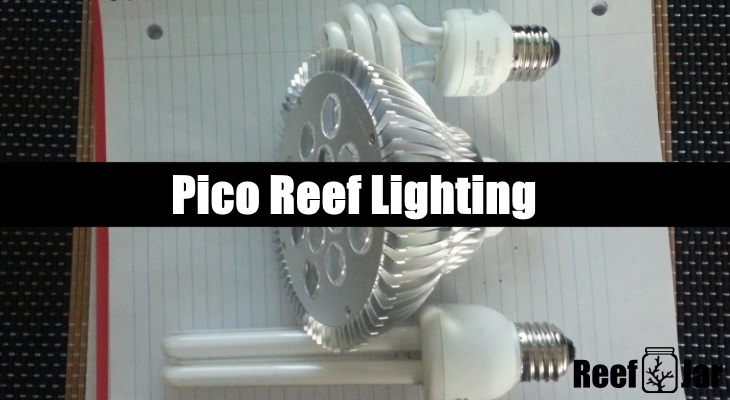 If you plan on keeping soft corals like leathers and xenia, maybe even LPS like a hammer or frog spawn, this light might enough for your pico reef provided you can keep your jar or vase at a stable temperature in an acceptable range. A computer fan might be a good way to keep the light cool but that just makes things complicated. This light was bought on recommendation from Mary who used it on Maritza the Vase Reef. It’s definitely capable of growing SPS in the jar based on the corals growing in her vase. I purchased it on amazon.com for $24.99 + shipping. 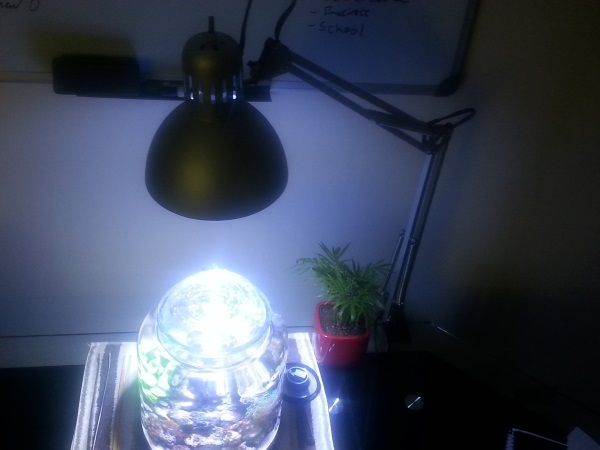 There are other LED reef bulbs that could work well, but this light will be perfect for my jar’s requirements. Some other brands cost $70 - $180 for a single screw type LED bulb. After testing for several days, I concluded that the light unit itself produces very little heat and virtually no heat is transferred to the jar. Perfect! Now that you have a bulb picked out, you will need to figure out a way to house it over your pico reef. If you don’t want to do a lot of DIY I suggest an LED style bulb so that you can use a goose neck lamp. ​I have this setup beside me on my computer desk and there is minimal light bleeding out because this LED is very directional with its light. It definitely doesn’t bother me while I’m working. This light is great for Mini and Pico Reefs. It will grow SPS,LPS,Octo Corals,Softies,Macroalgae,Barnacles,Photo Sponges,etc, providing that all other variables and parameters are met. I’ve been using this bulb for 2 years now and it’s still going strong. I had a different bulb before, Par 30, but it didn’t have the balance amount of Whites and Blues. Inexpensive and a 14K look. In the market for an inexpensive and Reef growing proven light for your Pico and Vase Reefs,you may consider this Par 38. Great Site and Beautiful Pico Reef. I just started keeping a saltwater tank. I have the picotope. The lfs mistakenly gave me a white spot anemone shrimp instead of the ghost shrimp that I asked for. My question is are there any anemone small enough to put in this tank? Most anemones grow quite large. However, you could consider rock anemones. Some consider them pests, but each to their own. 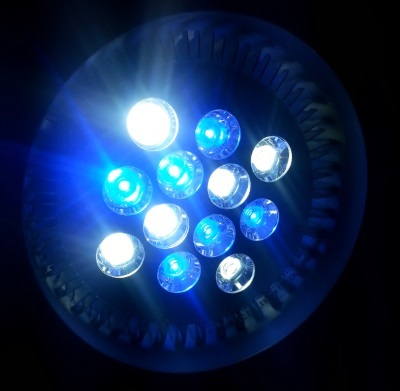 I cannot find a link to purchase this bulb “12w Par38 4 whites @ 20000k 8 Blues (435+nm range)” Can you send me a link? I searched online and everything I found was sold out or not the exact same as you described.